In January of 2004, during the Los Angeles NAMM show, the Edge’s longtime guitar tech, Dallas Schoo, tracked down Line 6’s Tim Godwin (Artist Relations) to talk about the latest U2 project titled How to Dismantle an Atomic Bomb. During that meeting, Schoo explained to Jeorge Tripps (Senior Product Manager/stompboxes) and Godwin just how much the Edge had used the DM4 Distortion Modeler stompbox. 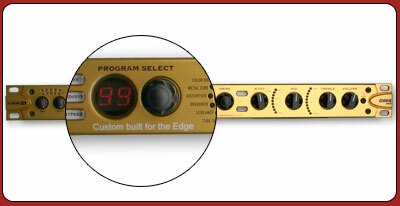 The Edge didn’t just use a DM4, he ended up using 11 DM4’s during the recording of the record. Why? Once the Edge came up with a tone for a song, it was stored in one of the four preset locations for later use on an overdub or a tour. So rather than erase tones when they used up all four user programmable presets, the Edge and Schoo just kept buying more of them as the recording progressed. With U2 getting ready for a tour, Schoo needed to find a solution to carrying around the 11 DM4 stompboxes they had with all of the tones from the record. Schoo was wondering if a rackmount version with program memory and MIDI could be built in the same format as the Filter Pro and Mod Pro studio modelers. Thank you Line 6 for sorting me out with a rackmount version of my DM4 stompbox... it sounds great and I know I'll be using it a lot come the next tour... I still love the stompbox though! This sent Tripps running into the office of Angelo Mazzocco (Senior DSP Software Engineer), Line 6’s lead pedal technology guru. 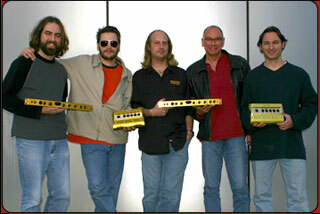 Although Tripps and Mazzocco were both in the middle of creating the entire ToneCore pedal line, they couldn’t pass this up. 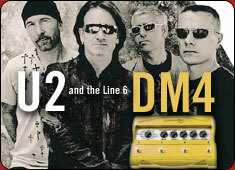 They turned to other diehard U2 fans on the Line 6 staff, like Dave Calvery (Senior Software Engineer) to work on the micro controller, and Jason Lynn (Graphic Designer) for the front and rear panel artwork. Adding to their responsibilities for other Line 6 projects, this small group of people burned the midnight oil, working under the radar to make this unique project come to life. Tripps and the team wanted this custom piece to look just like a production unit and not some taped together garage jalopy. What they came up with was even better than anyone could have imagined. The DM4 Pro Rack has a custom designed analog path and full MIDI implementation with assignable controllers for every parameter for real-time, expressive control of the tone and drive knobs. They even had it laser etched with a special inscription for its new owner: Custom Built for the Edge. The main guitar sound throughout the new U2 single "VERTIGO" played by The Edge, was the result of the combination of the Line 6 DM4 stompbox, a vintage echo unit, a vintage '60s Telecaster and a vintage Fender Amplifier. This guitarist likes to work with cutting edge technology as well as vintage pieces. When Dallas and the Edge received the unit, their first remark was that they couldn’t believe how professional it looked and how everything was beyond their expectations. This was a true team project that took some very dedicated people to make happen, which is what Line 6 is all about. We’re proud to be involved with one of the most innovative and respected bands of the last two decades.